How long has it been since you’ve run as fast as you could for even a few steps? Think about it. I exercise quite a bit and it’s a special day when I actually incorporate some kind of “sprint” into my workouts. However, I’m going to avoid talking about this in the “workout” paradigm. 1. 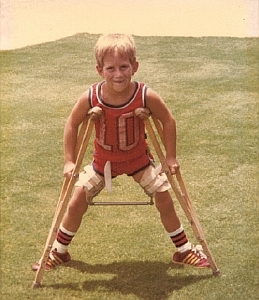 Celebrate YOU – if you have two functioning legs, can you think of a better way to celebrate the amazing power and ability that you have been blessed to possess? By running at top speed, you’re using those legs of yours at their max potential. Isn’t that a wonderful way to say, “Thanks, Universe!”? 2. Return to your youth – Remember those times when everything could turn into an ALL OUT race? Getting to the swings, sprinting out of class for recess (usually only once before the teacher put a rule about that…) or a vigorous and oh so dangerous game of Red Rover. I can practically guarantee to you that if it’s been that long since you’ve gone on an all out run, you will feel that thrill of youth…even if it’s probably going to be immediately followed by gasping for breath and the next day with some soreness. 4. Push yourself to your “limit” – Really, this is any easy way to push yourself to your absolute limit. Rarely in life do we find such a stark “wall” that says we cannot go any further. You go as fast as you can and you can feel good knowing you gave your 100% effort. Now, with practice of course that “wall” can be moved but with a full on sprint no one has to tell you that you can’t run any faster, you are simply putting one leg in front of the other as fast as you know how at that given time. This can give you a sense of satisfaction like few other tasks can because of the totality of effort placed in the task. I know that I have the over-achiever’s habit of always telling myself, “I can do more” (I know, I need to work on some balance in my inner-dialogue) so for me it’s a relief to run as fast as I can because the only thing my inner-critic can say is, “you’ll be able to run faster next time”. That’s actually a big consolation because I’m not beating myself up over the present/near-past. ***Warning*** – Running is EXERCISE. Please consult your doctor before you start any exercise program and ESPECIALLY before you start sprinting all over the place! And even if you’re in “shape” and work out all the time, take care in just going out and doing an all-out sprint. Seriously, if you haven’t run full out PLEASE work up to it. There are muscles, ligaments and tendons that will not have been put to the test like this in any other endeavor because there’s nothing like running full out except for RUNNING FULL OUT! 30 – Second Sprint Workouts (this is an external site link of an article I think speaks intelligently enough about the subject that I was willing to link to it): If I were training you, and I’m NOT, I wouldn’t even jump into the 30-Second Sprint Workouts program until I really knew your fitness level/overall health. Again, I’m seriously advocating that you work up to an all-out sprint. Go 50% of what you consider your max. Do 3 of them. In a few days, if you’re not too sore, try 3 at 60% and so on. Work up to your all out sprint! Oh, and remember to sprint on a safe surface…if you go to a park and run on the grass there could be gopher holes or rocks that could make a twisted ankle, or worse, very easy! PS…On a personal note, I was unable to walk or run for 3 years during my childhood so I really enjoy the current blessing of being able to RUN, RUN, RUN!!! This entry was posted in Exercise, Fitness, Wellness and tagged Celebrate, Chris Burton Jacome, Inner Cave Man, Inner Cave Woman, Return to Youth, Running, Sprint Workout. Bookmark the permalink. 2 Responses to Up for a RUN? You have always been an inspiration to me! I remember the days when you couldn’t walk, never a complaint out of you. You pushed yourself and made the most out of everyday! I also remember watching you cross the finish line after your first marathon. I will never forget the overwhelming feeling of pride that filled my heart. I was so proud of you that day, just as I am every day! I love you! Thank you for being the best big brother in the world, for being my hero and my best friend!! Hey Sis! Thanks so much! I was not alone on my journey. It was with the love, support and much help from you, Mom, Dad and everyone else in our family. We have all been blessed to be able to share this journey together but from different perspectives. I love you MUCHO, Sis!